Liscombe Lodge launches new Nova Scotia wedding guide to assist the planning of a Maritime wedding. With our new wedding guide, wedding planning has never been easier for the bride and groom as it details ideas, prices and packages for their special day. Liscombe Lodge Nova Scotia Resort launches new maritime wedding guide to help plan the perfect Nova Scotia wedding. The Liscombe Lodge wedding brochure includes the specific detailed information a bride and groom would need to plan their rehearsal dinner, ceremony, and reception at the Nova Scotia resort. 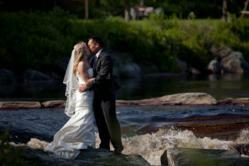 The new Nova Scotia wedding guide describes options available to the bride and groom for a wedding at Liscombe Lodge. The detailed document consists of reception and entertainment ideas, catering options, guest accommodation prices, frequently asked questions and much more. The Nova Scotia resort offers all-inclusive wedding packages including available indoor or outdoor venues with a variety of locally inspired or buffet menus at the Nova Scotia restaurant, the Riverside Room. Liscombe Lodge Resort as it offers an intimate setting on the shores of the Liscomb River. To download ceremony and wedding menu options or for more information about the Nova Scotia resort, visit Liscombe Lodge online.